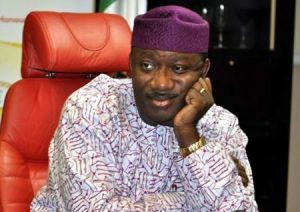 I have not received any pension from Ekiti govt | Fayemi tells SERAP – Royal Times of Nigeria. Minister of Mines and Steel Development, Kayode Fayemi has threatened to sue the Social-Economic Rights Accountability Project (SERAP) if it does not prove that he receives pension from Ekiti state government. SERAP in a statement on Monday said the former Ekiti governor and some others serving in other positions were receiving double pensions. While responding, Fayemi said he would sue the group if it does not prove its allegations. “Contrary to SERAP’s statement, the fact is that Dr Fayemi does not enjoy any pension from Ekiti State government neither has he received any severance package as approved by RMFAC. “All SERAP needed to have done in this case was to place a call to the Minister or carry out a thorough investigation at the Ekiti state Ministry of Finance, before going public on such a sensitive matter. “The leadership of SERAP is urged to do the needful- substantiate the allegation with proof or retract the highly embarrassing statement and offer a public apology to the Minister within seven days or be prepared to defend it in the law court.”.